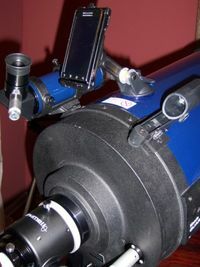 I get a lot of reports of people using SkEye with their telescopes. 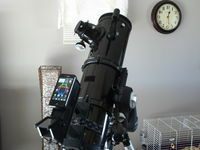 Here, I am collecting all the different ways that phones have been mounted with the telescope body (OTA) so that you could derive your own ideas from them. 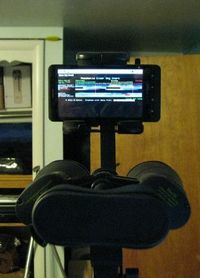 One CloudyNights member, WaterMaster, hacked out a nice design for attaching his phone on his binocular mount. 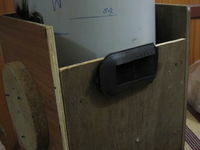 In the linked page you will find a lot of detailed images of his setup, but you need to be signed in to see the images. 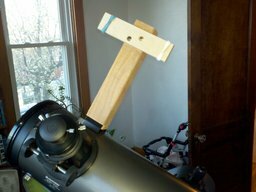 "This is how I use SkEye on my SCT. 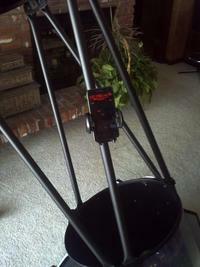 I used a Magellan GPS suction mount and fitted the standard Droid vehicle mount to it. The Droid mount suction cup does not hold as well. It has stayed on the OTA for weeks like this." Yet another CloudyNights member, Steven Plant (Project Galileo), has been modding his 16" LightBridge with various hacks. Here is his post about the "phone mod". The tubes of the LightBridge are Steel and cause magnetic interference. But the truss poles are Aluminium which don't cause any interference; hence they are the best place to attach the phone. There are many tips and pictures of the mod so please check out the full post. I have seen quite a few people attaching the phone on their Telrads. IMO, this is not a good idea. The batteries and circuits in the Telrad may cause interference. In the very least you should switch off the Telrad while using SkEye (if the phone is attached near to the Telrad). The video also demos an app called Calibrator (that works only on rooted devices). This app can add a hue/tint to the entire phone display. It is very handy to add a red tint for preserving dark eye adaptation. Checkout this creative use of packaging material for mounting the phone (three images toward the bottom): Packaging material used for mount. Carl fashioned out a bracket using two wooden pieces. Two rubber bands clamp the phone to the bracket. See photos and description here. Marco in the comments posted an easy solution that I think will work very well. Read the first comment to this post below. I stitched a Velcro strip to the back of an old phone jacket. The complementary Velcro strip was nailed to a wooden plank on the OTA. The phone can be slotted in quickly when required. If you have come up with an idea for mounting the phone, please share it via the comments or email/tweet me. I want to keep this list updated whenever I find a new idea.